During or just towards the end of WWII my mother rented a house that was partly a farm. The large backyard faced on the muddy Thames River and the front of the house,faced a street called River Road. River Road has since been made popular in a song by Sylvia Tyson. This was a rural environment, just outside the small city of Chatham, Ontario. Farms were all around us. Located in Southern Ontario, the Chatham/Kent area is kind of a Canadian bread basket. Across the way from us was a farm where they had the most wonderful apple orchard. We liked to sneak over there and pick up the windfalls, apples that had fallen naturally from the tree, because they were very sweet. Mother pig and her piglets had the same idea. The piglets were there and we found them and we thought of them as toys. My sister, three years younger than and I, was between the ages of seven or eight. We were munching on apples and tossing apples at the piglets and listening to them squeal. Then came a monstrous apparition, the mother pig. She was gigantic. She was angry. She was coming straight at us and I knew that we were in a whole lot of trouble. Now apple trees have fairly low limbs and they're pretty easy to climb. I ran for the nearest accessible tree, dragging my sister by the hand behind me. I started to climb up but she couldn't climb because she was too small. She was wearing a short, print cotton dress and not much else because it was summer. I dragged her up the trunk of that tree, ignoring all obstacles such as bark and projections, to where I was and then up a little higher, so that we were well out of reach of mama pig who was snorting and huffing around the tree below us. We stayed up that tree what seemed like forever. Eventually the mother pig forgot what she came for and wandered away. Very carefully and very quietly we went down that tree trunk. I lowered my sister . She was all scratched and scraped and bloody and dirty. I was in somewhat better condition but I knew I was in for it when we got home. I don't remember if I told me parents about the pig but I may have said something about climbing trees. In any case I got what we called a 'lickin' for that, a good, old fashioned one with a strap. I'd saved my sister's life, not because I was so terrible fond of her at the time but because I'd have been in SO MUCH TROUBLE if the pig had eaten her! You may remember in the Wizard of Oz when Dorothy fell in the pig pen and the farmhands were in such a hurry to rescue her. Well, pigs'll eat anything. Go figure! Now, here is the story of Rooster Booster. My mother kept chickens and we had a Victory Garden. It was part of the war effort to grow your own food. She started out with Bantam chickens, which are very small. She had hens and a rooster, nicknamed Rooser Booster. The hens laid tiny eggs. Later, my mother got some Leghorn chicks and they guaranteed that these chicks were all female but one of them slipped under the radar and and he was male, very much so. When those little chicks were growing up Rooster Booster, the Bantam, used to pick on that Leghorn rooster chick. He gave him such a hard time. Of course the Leghorn chicks got bigger. The Leghorn rooster started to get tall and lanky. As an adolescent he was still scared of the Bantam rooster who would chase him all around. This little Bantie rooster chasing around this big old Leghorn was quite a funny sight to see. 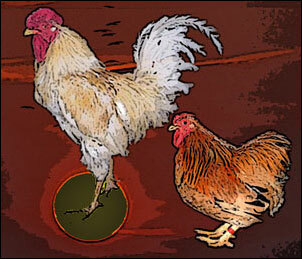 One fine day the Leghorn rooster realized that he was bigger!!! He turned on the Bantam and, well, that was the end of Rooster Booster. You could say that it was the end of tyranny or whatever you want but it was curtains for Rooster Booster. Just down the road from our farmhouse was a really big sugar beet factory. Sounds harmless but in summertime the smell took some time getting used to. There were mountains of sugar beets which they processed and then the leavings were dumped across the way in a sort of artificial swamp or lake they'd built up a hill with a road going across it and big pits on either side That's where they dumped the leavings which fermented and produced quite an odour. I guess the rent was cheap thereabouts. One time a truck slipped off the road and into the bubbling morass of sugar beet leavings never to be seen again. The driver escaped but the truck is still down there someplace. The sugar beet processing plant is gone now and I think they've changed the name River Road to Riverside Drive, or something like that. Where the sugar beet dump was is solid ground now and they've built a subdivision on it. That dump has become prime property. I used to run away just about every Spring, starting when I was five or six or younger. Something about springtime would get into my blood and I'd run off to join the Gypsies. I never found them but I'd run off to join them anyways. One time I scampered off when I was just a toddler and ran across a field with a bull in it. Nothing happened to me. I think animals know when a body is too young to fuss with. I ended up inthe Chatham Police Station where the policemen fed me ice cream. This may have encouraged me to continue to run away each Spring but I suspect it was just Spring Fever. I always came back and, after a while, my folks got to the point where they'd say "Where's Sonia? Oh, it's springtime. She'll be back when she gets hungry.